The holiday season is around the corner and now is the ideal time to start marketing to that email list! If you have been using the 'mandatory email login' feature for your event albums, you may export a list of email contacts you have collected thus far and market a highly effective end of the year special to these potential clients! You can run an enticing and time sensitive offer by setting up a volume discount through your Photostockplus account! For only $149, let our marketing experts help you decide on the proper promotion and take care of the complete set up and mailing of your first mailer campaign to assure a smooth email delivery without a glitch! Take a look at the following mailer for an example of the quality you can expect letting us help you with your holiday promotion! For more information or to place your order for the 'Complete Email Marketing Assistance Package', contact us today! Please note that long term and more advanced email marketing strategy maintenance and implementation is also available. Please contact us for more details. Have some HTML and marketing experience and want to run a mailer campaign on your own? Photostockplus has partnered with iContact in order to help you send targeted visual HTML mailers (much like this one) to your email list and clients! iContact makes email marketing easy with the help of templates and a straight forward platform providing you with detailed reporting and tracking for every message sent! Use the links provided in this mailer, or click here for a special free trial offer! 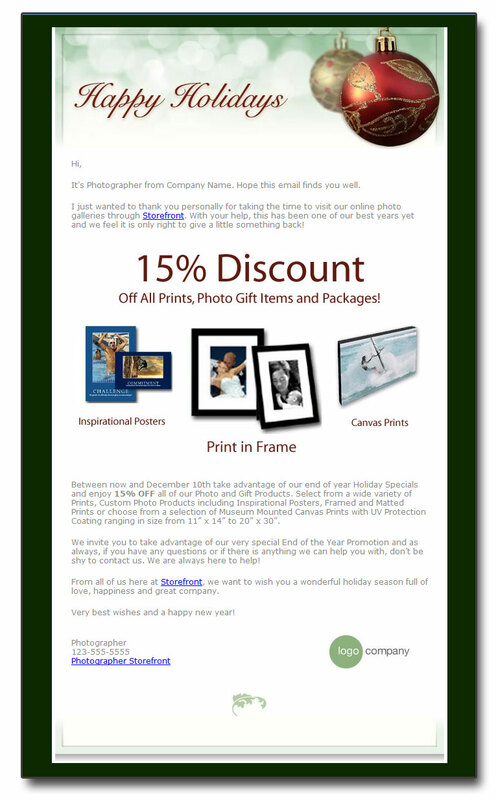 We look forward to assisting you with an effective and profitable mailer strategy this holiday season! This entry was posted on Friday, November 26th, 2010 at 8:23 pm	and is filed under Blog. You can follow any responses to this entry through the RSS 2.0 feed. You can leave a response, or trackback from your own site.